Well this set build is crawling, inching or rather micro-millimetering along. Here is the link to my last update which wasn't as long a gap as the previous time between updates. Looks like this update only increases the count by one card, even though I had gotten two 1965s recently. Explanation with card descriptions. 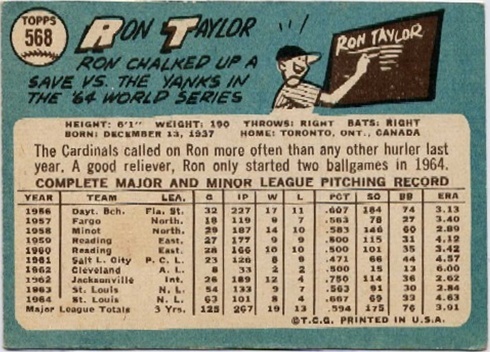 568 Ron Taylor Cardinals. No special story with this card. 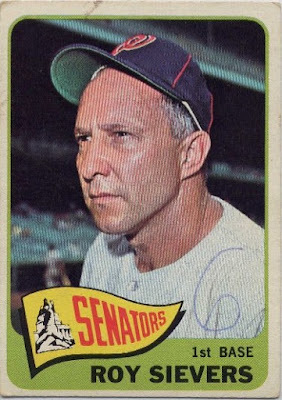 I did bid on another Sportlots auction for a small handful lot of 1965 cards, I forget how many were in the lot maybe no more than a dozen, but I low-balled a little and got outbid. 1 card purchased from Ebay as BIN. $7.16 Free Shipping. 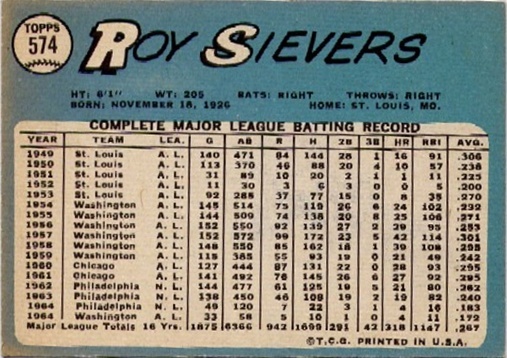 574 Roy Sievers Senators - on card autograph in blue sharpie ink. 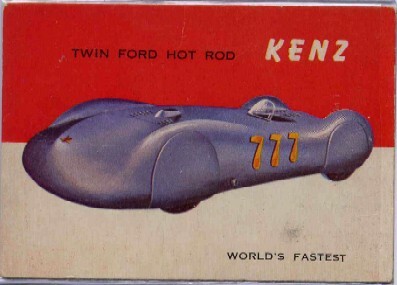 OK so this card I already had a copy (which I show first below). So it doesn't get included for the "Strive For '65" card count. 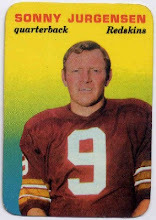 There was no "certificate of authenticity" (COA) for this card/purchase. I don't know for sure if it is a legitimate signed in person or through the mail autograph, but I will think that it is. 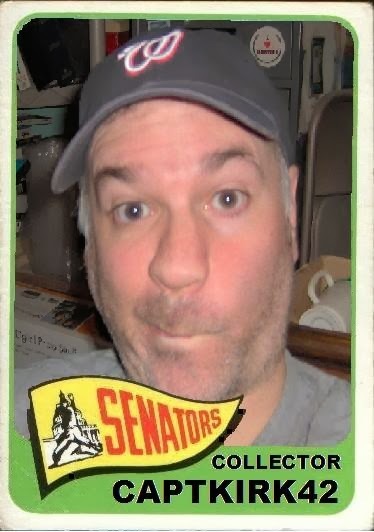 I have no plans to sell it at anytime so that point is sort of moot as it is for most of my other signed cards. I like it that is what matters to me. 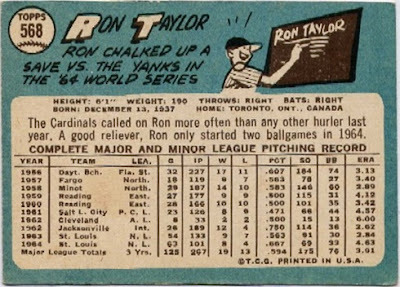 I should blog about this card on my Curly W Cards blog. 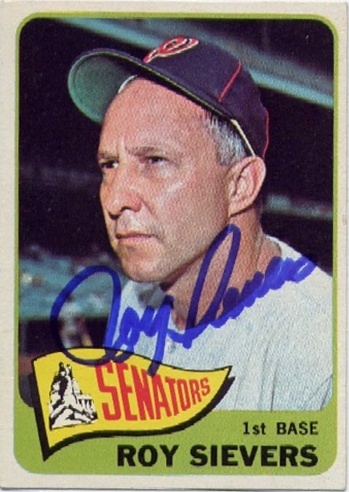 For some reason whenever I look at Roy's '65 card I keep thinking he is the manager. 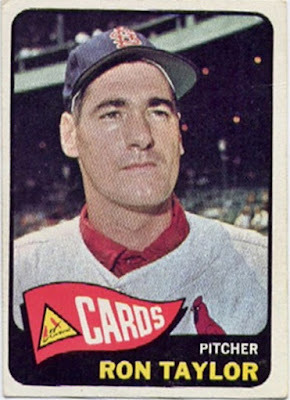 Sievers really does look like he'd be the manager. It's that grey hair I guess. That's an upgrade for that card for sure. And the Cardinals black/red scheme in this set is pretty sweet. It's one of my favorites. Nice adds. Talk about your Grandpa Rossy. Grandpa Roy! But so many of the guys in the 60's looked older than they were.